Most readers are familiar with William Wordsworth, easily recognizable as a Romantic ‘nature’ poet who wrote about daffodils and long walks in the Lake District, as well as a few ballads about the poor with his best friend Samuel Taylor Coleridge. While these associations aren’t necessarily false, they can block us from what’s going on in Wordsworth’s poetry. 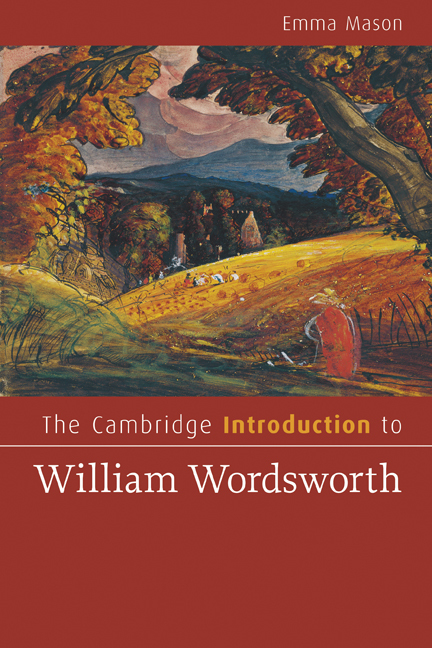 Rarely does Wordsworth actually describe nature in realist terms and readers hunting for social and cultural references often overlook the stories he does tell about people and their relationships with each other. The details of his life and times might be interesting – the social and cultural landscape of the Romantic period underlines Wordsworth’s thinking – but they can distract us from the experiential intimacy he creates within his poems. Many academics, for example, read Wordsworth’s poetry through ideas about him – as an egomaniac (they say he always writes about himself too much), as politically dubious (they say he appears to change his mind about issues like revolution, war, violence and the class system) and as unable to relate to women (they say his marriage appears oddly chaste by comparison to his deeply passionate relationship with his sister, Dorothy). While I argue firmly against these ideas about Wordsworth in the book, I also encourage the reader to approach his poetry without contextual detail and attend to the sounds, rhythms and emotional content of his poetry instead. Here’s an example: in the late 1790s, snow-bound in Germany with his sister Dorothy and feeling lonely and isolated, Wordsworth wrote several poems about a ghostly girl called ‘Lucy’. She’s an unnerving poetic figure, who lingers in Wordsworth’s poems like a hypnotic shadow, seemingly neither fully alive nor dead. From the early nineteenth century, critics have tried to unlock the secret of Lucy’s identity: is she Dorothy? Is she Wordsworth’s illegitimate daughter? Is she Wordsworth? Is she ‘nature’? Is she the corpse of a murdered servant girl? Is she, as the Victorian critic Samuel Butler insisted, Wordsworth’s spurned lover whom he turned on, cut her throat, and buried near to his home in Grasmere? Displacing the poem with ‘true crime’ might be momentarily titillating, but focusing on it means we no longer need to think about the difficulties with which Wordsworth’s poetry presents us: we can’t read his poems if we’re busy sensationalizing what’s in them. Wordsworth actually counseled readers against sensationalizing life and poetry in his ‘Preface’ to a collection called the Lyrical Ballads: he forewarns us that a ‘degrading thirst after outrageous stimulation’ leads only to ‘melancholy’ and depression. As a man who struggled with bouts of hopelessness, not least those wintry days in Germany with Dorothy, Wordsworth chose to re-create what he saw and heard in the world to re-energize his experience of it. In doing so, I think, he conjures it (or, in Wordsworth’s vocabulary, ‘incarnates’ it) within the reader’s experience so that we can reflect on what he’s seen and heard on our own terms. So how might we read ‘Lucy’ once freed from spurious conjecture? In ‘A slumber did my spirit seal’, given in full below, Wordsworth says she is a ‘thing that could not feel / The touch of earthly years’: she is almost inhuman but still capable of taking away the narrator’s ‘human fears’. She has ‘no motion, no force’ and ‘neither hears nor sees’, condemned to endlessly roll around in ‘earth’s diurnal course / With rocks and stones and trees.’ She is a moment in time, in our time as readers, a ‘thing’ that paralyses us, refusing to explain who she is or what has happened to her. We sense that she is lost, and that our experience of this loss might elicit feelings of grief or confusion in us that, rather than shut us down, open us into questions about ourselves and also those with whom we live and care about. I’m not suggesting Lucy is a like a big searchlight Wordsworth turns on us to enable self-understanding. I think that the absence of answers in his poems about her, and about the world, motivates conversation and interaction that generates new ideas, perceptions and ways of thinking and feeling of which we as readers are otherwise unaware. This is why Wordsworth is my favourite poet: whether he’s describing the calls of owls, the light of glow-worms, the movements of hedgehogs, the faithfulness of dogs, the visionary, the apocalyptic, the sublime, God – all of it is embodied in words that at once steady and intensify our own reading of the world, carrying it ‘into the heart’, as he wrote, with a tenderness and gentleness few writers achieve. His poems evolve as we read them, both on our own and with others, suggesting that we stop attempting to solve their content and instead continually re-imagine them.